Oil and natural gas form over long periods (millions of years) as the remains of microscopic, photosynthetic organisms known as phytoplankton, which live near the surface of open aquatic environments, accumulate in subsided geographic features—referred to as sedimentary basins. Organic matter is buried by other sediments derived from weathered onshore landscapes that are transported to where they are ultimately deposited, generally in coastal environments, though lakes can also accumulate significant sedimentary deposits. Pressure and heat resulting from the weight of these sediments alters carbon bonds in the organic matter, leading to the formation of a waxy material known as kerogen. In turn, with further pressure and heat, the kerogen “matures” and is converted to liquid (oil and NGLs) and gaseous (natural gas) hydrocarbons in a process known as catagenesis, which is not unlike the process by which petroleum distillates are refined, or cracked, in industrial refineries. Alternatively, natural gas can be formed by microorganisms referred to as methanogens that exist in extreme environments, including deep within the Earth’s crust. Methanogens produce methane as a metabolic by-product. Oil and gas are typically discovered in association with each other, although their proportion depends upon the processes driving maturation in the basin. Oil generally implies a lower degree of maturation, NGLs represent intermediate maturation, while natural gas represents the final stage of hydrocarbon maturation before being considered over mature. Over mature compounds lack the energy-storing bonds that make hydrocarbons commercially valuable. As oil and gas are formed, their lower densities make them buoyant relative to the surrounding rocks and subsurface water. This causes them to migrate toward the surface as they are expelled from the source rocks from which the organic material was derived (Exhibit 2). Hydrocarbons tend to accumulate when they encounter confined porous rock units. In some cases, these units are also permeable, meaning that the porous spaces are connected to the extent that hydrocarbons can flow through them if exposed to differential pressures (e.g. a well borehole). Historically, it was these post-migration accumulations that were sought after for commercial exploitation. Today, these accumulations have come to be known as conventional reservoirs. However, with the advent of horizontal drilling and hydraulic fracture stimulation, the low-permeability source rock can also be produced economically. 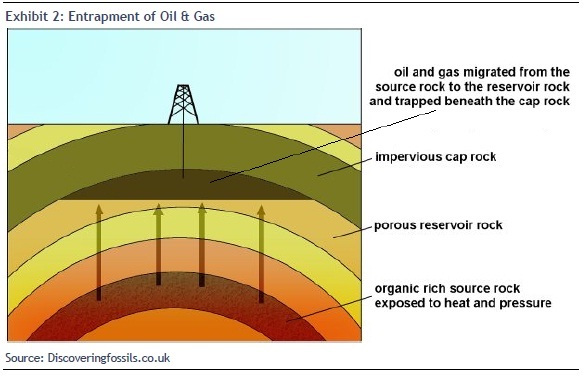 These accumulations are typically referred to as unconventional reservoirs; although, the term is something of a misnomer insofar as reservoir implies porosity and permeability conditions typically associated with conventional E&P.